Marion, Iowa. 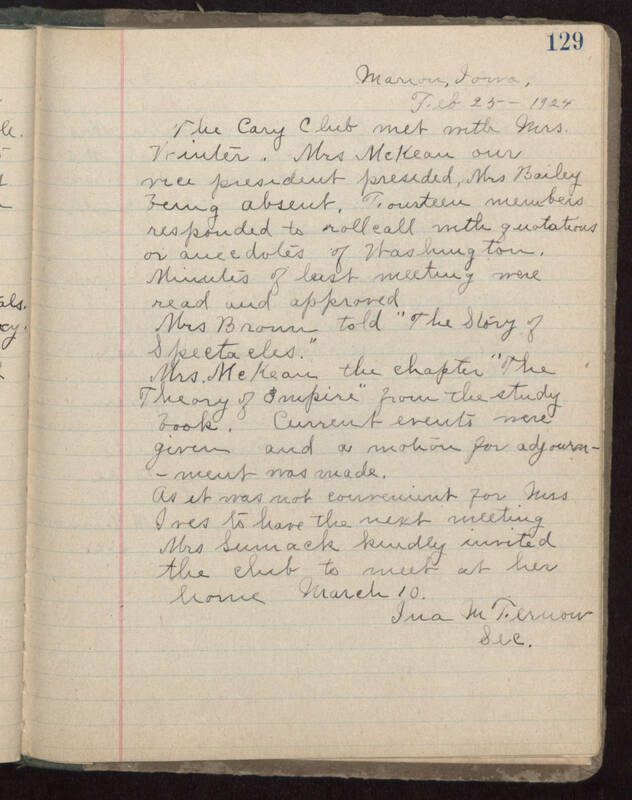 Feb 25 - 1924 The Cary Club met with Mrs. Winter. Mrs McKean our vice president presided, Mrs Bailey being absent. Fourteen members responded to roll call with quotations or anecdotes of Washington. Minutes of last meeting were read and approved. Mrs Brown told "The Story of Spectacles." Mrs. Mckean the chapter "The Theory of Empire" from the study book. Current events were given and a motion for adjournment was made. As it was not convenient for Mrs Ives to have the next meeting Mrs Scumack kindly invited the club to meet at her home March 10. Ima M Fernow Sec.